The INEC National Commissioner in charge of Borno, Adamawa and Taraba States , Air Vice Marshal Ahmed Tijani Muazu (rtd) on Thursday presented certificates of return to the Borno State Governor elect, Professor Banagana Umara Zulum and his Deputy Alhaji Umar Usamn Kadafur. He also presented certificates of return to all the 28 members-elect of the Borno State House of Assembly (BOSHA) representing the 27 LGC Constituencies at the Kashim Ibrahim College of Education Conference Hall, Maiduguri, the Borno State INEC Collation Center for the Presidential , National Assembly and Governorship elections. He further urged them to keep to their electioneering campaign promises to the electorates and work hard towards the development of their state and localities. Muazu however thanked the supporters and stakeholders in the state for the support and cooperation given to INEC during the conduct of the elections in the state which helped the commission to carry out its constitutional manadte geared towards free, fair and credible general elections in 2019. He said the presentation of certificates to winners of the elections was mandatory and in compliance with the provision of section 75 of the Electoral Act 2010 (as amended). Responding, the Governor elect, Professor Banagana Umara Zulum acknowledged the support and efforts of all INEC staff in conducting a hitch free and successful general elections while congratulating all the national and state assembly member elects from the state from one political party, APC. He commended the sacrifices of the APC stakeholders, electorates and security agencies in the electoral process while assuring to build on what his presedeccssor may stop at by the end of his second tenure. 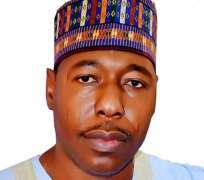 Zulum further commended the people of the state for having confident in him to move the state forward while pointing out that his administration will focus on a 10- ppiint agenda to rebuild and redevelop the state. He however said his immediate target is to ensure the safety return of all IDPs back to their communities and strengthen security across the state, stressing that, as part of his measures to address security challenges, issues of unemployment, job creation, education or schooling which are the root causes of Boko haram insurgency for long will be tackled squarely.